Defender Ben Barclay admitted Southampton’s late winner in the Carabao Cup on Tuesday evening took the gloss off his Albion debut. Charlie Austin headed home the only goal two minutes from time to send the Saints through to the third round. Both sides made ten changes from their Premier League matches at the weekend and Barclay made his debut alongside goalkeeper David Button and fellow under-23 players Will Collar and Viktor Gyokeres. Club record signing Alireza Jahanbakhsh also started for the first time. Asked if the late goal took the gloss off his debut, Barclay said: “It does. If it’s your debut, whether you have a good game or not, if you concede at the death it’s going to be frustrating. “It was good to make my debut and I was reasonably happy with my performance. It was a good test, especially for us young lads. “To concede in the last five minutes of any game is a bit annoying but us young lads especially are proud of ourselves as we played against some good players. 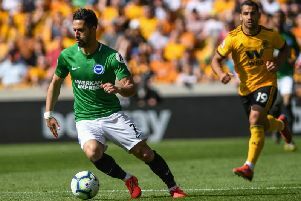 Barclay was in the Albion party which travelled up to Liverpool on Saturday but was not included in the final 18-man squad and he admitted it helped making his debut alongside Collar and Gyokeres. He said: “If you’re all playing together, it settles the nerves a bit before the game. Pre-match you’re with your usual team mates and you can chat to them. “I had most of my nerves going up to Anfield on Saturday. I missed out on getting on the bench there but that was a good experience. On potentially going out on loan, the 21-year-old said: “I think it depends how close I am to the first team squad. There were a couple of injuries last week, which helped me out. Albion are back in Premier League action on Saturday when they entertain Fulham at the Amex (3pm).